Knowing your strengths and your enemies' limitations will help you win battles quickly. We shared some of our best tips and strategies for earning in-game currency in Angry Bird Epic. Today, we're going to share some of our best strategies for battling Prince Porky's thugs. If you're new to the game, take a few minutes to check out our beginner's guide to get started. There are many ways to take on the pigs in Angry Bird Epic, but in order to get three stars and increase your chance of getting more loot, you'll need skills and strategy. Knowing your opponent's weaknesses is the best way to make the most of your birds' abilities. Knowing your strengths and your enemies limitations will help you win quickly in battle. 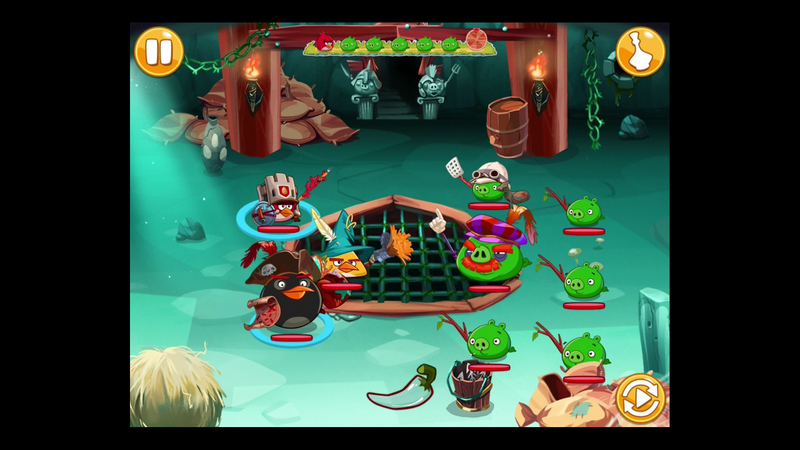 Angry Bird Epic eases you into the RPG strategy with complimentary abilities. You start off with your basic ability, which is a direct attack that damages enemies. Your secondary ability is supportive, allowing you to protect, power-up or heal your birds. This combination of abilities is the foundation of the strategy behind Rovio's RPG. Each enemy pig has a similar combination of skills to attack our heroes. Some of these combinations have no effect, while others can make battles long and arduous. In order to avoid a long battle, you should take the time to know your enemy. It doesn't involve tons of research, and we made it easy for you in our Angry Birds Epic enemy guide. If you're in the heat of battle against a pig you've never faced, press and hold the pig to learn more about it. You'll get important details like health, secondary ability, primary attack and damage. How do you determine what strategy to use on pigs in Angry Birds Epic? Knowing what strategy to deploy against pigs are determined by your abilities. Class, Weapons and Off-handed items directly affect what abilities are available. Experiment with different Class, Weapons and Off-handed items to compliment your birds' primary and secondary abilities. One of our favorite Class combinations is Lightning Bird, Druid and Pirate. This combination utilizes Chuck, equipped with Feather Broom and Scroll. Matilda equipped with Flower Comb and Colorful Bag. Bomb equipped with Red Fist and Mad Mojo. Chuck's load out allows him to cast Drain Energy on pigs by removing helpful effects while doing damage. Matilda's load out is supportive because it heals the flock, tenderizing a pig with damage over time (DOT). Bomb, our heavy hitter, increases the flock's attack power by 25 percent while dishing out damage over 100 HP. This strategy allows us to power-up our flock, support them with healing while keeping the pigs from getting the upper hand by doing regular damage and dispelling their power-ups. How do you effectively use strategy in Angry Birds Epic? Our combo example mentioned above can be used as a good strategy to break down a group of pigs. To use this strategy effectively, you must first enable the Bomb secondary power-up ability to give the birds a 25 percent attack boost. Then you target your biggest threat and cast Matilda's thorns for DOT. Use Chuck's Lightning ability to turn the pigs into bacon, kicking it up a notch from the Bombs power-up. Each ability lasts from one to three turns, and varies if the attack is primary or secondary. Once you've established this strategic attack chain, you'll use standard attacks to help heal or whittle the enemies' HP when secondary abilities are enabled. How do I properly assess a battle in Angry Birds Epic? It's important to have the right load out when going into battle. After a quick review of the pigs, you should be able to determine if your current team is up for the job. Don't get discouraged when you start a battle and realize that you could have chosen a better bird or equipped a better item. Equip your birds with the proper Class, Weapons and Off-handed items to effectively handle the situation. It's best to avoid a long battle that could hinder your chances of maximizing loot. If you've just started the battle, there's no harm done, if you haven't thrown the first punch, simply back out and visit the nest to get the proper load out. Good Epic players know when they should regroup and return with a stronger strategy to make the battle short and sweet. You now have a few tips and strategies for properly utilizing Classes, Weapons and Off-Handed items in Angry Birds Epic. Don't let your eggs get scrambled and remember to like us on Facebook so we can team up to stop King Pig. Share your tips and strategies for some your favorite Classes, Weapons and Off-Handed items in the comments below.